Big Blue DFW: Get the poison out Raven... I mean G-Men! Get the poison out Raven... I mean G-Men! "Go ahead and do what you got to do to get the poison out today, whatever it is!" "If you got to drink, fight, sleep, whatever you got to do, when the sun comes up tomorrow, go to work and get ready to win a game." A few words spoken from a man of a few words. According, to Giants Center Shaun O'Hara, that was the battle cry from Eli Manning's locker room speech. 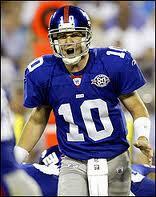 Did Eli sound his barbaric yawp over the roofs of New York of "Get the Poison Out!" Nice use of the quote made famous on Howard Stern. Did Eli consciously say it or did O'Hara take artistic license for a sound byte on Howard?